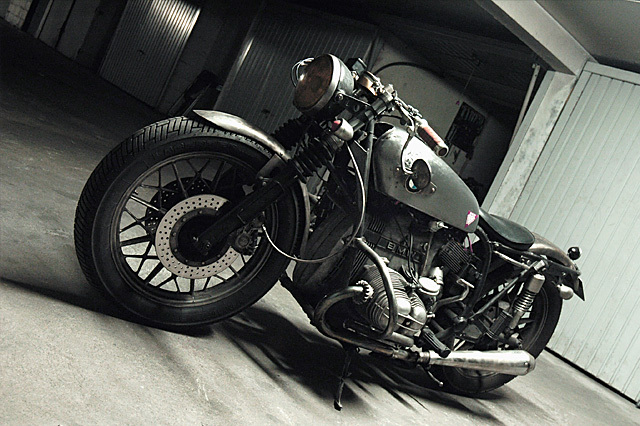 Arnaud was first drawn to the looks of the BMW thanks to the unique airhead engine and rode the bike around for a year before the idea to modify the Bavarian entered his mind. Having seen the R series BMW take off in the custom scene he could appreciate the scramblers and cafe racers but nothing really quite did it for him. So with a limited budget, a bike needing some repairing to keep it going and a love of old school American culture it is fair to say the Rat style chose Arnaud more than the other way around. The first step was to redo the ageing wiring that was starting to cause problems and anything that wasn’t needed was simply tossed in the bin. That’s part of the Rat bike ethos, why buy or repair a part you really don’t need…, well accept because they’re required by the “law”. So the instrument cluster along with its idiot lights, the big switch blocks and all the wiring on the bike that didn’t absolutely have to be there was thrown away. With the dustbin still open there was some more binning to be done, stock fenders – gone, BMW tank – not today, side covers – on a ratty? even the seat, tail section and handlebars were shown the door; talk about bare bones! To build it back up Arnaud first tried a pair of 50-year-old Peugeot tanks before settling on this old Yamaha unit. 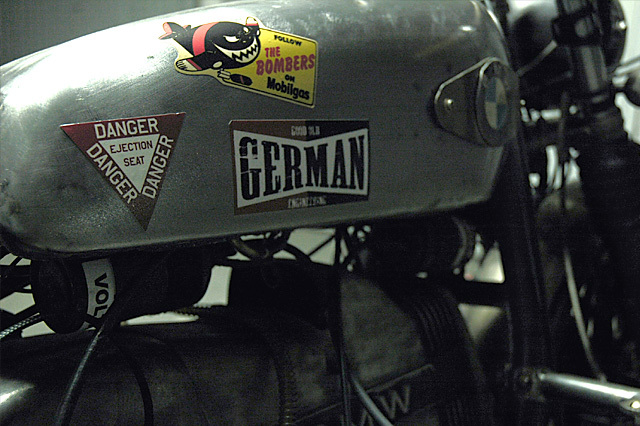 The BMW logos were salvaged from the original tank and join some haphazardly placed vintage stickers to cover any imperfections. The seat is gone but the factory subframe remains to show off more of the metal frame with seating now for one thanks to a vintage solo seat. The fenders also help to date the bike with squared off bobber style rear and wheel wrapping styling at the front they’re both left paint free and as raw as the rest of the build. While the main frame remains untouched, hey it still functions right, it does retain the patina of years spent on French roads for that kind of beauty only age can provide. All of the work to date would fall flat on its face if the BMW had retained its stock ride height and pogo-stick like rear suspension. If a concession is made in the Rat bike culture on cost, it’s to facilitate a meaner road presence but even this didn’t cost Arnaud more than a few Euros with the front end simply relieved of 8cm of travel. The rear end is a spare parts find that made the perfect fit and added a little American muscle with Harley 11-inch rear shocks getting the Bavarian down on the bitumen. The standard multi-spoke BMW alloy wheels are not what you would ever picture on a bike of such styling, but left wearing the brake dust and grim from the road they blend into the overall theme and cost not an extra cent. Wanting to ride the bike hard the one area the wallet was really opened for was good rubber and the Metzeler tyres maintain the understated look of the rolling stock while performing as well as anything on the road. 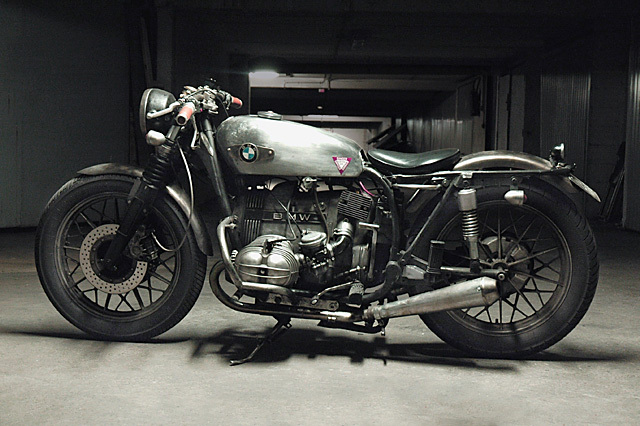 There are a number of aspects that make the BMW airhead engine perfect for a Rat bike build, not least of which is the fact that the engine dates back nearly 100 years but was still available only two decades ago. 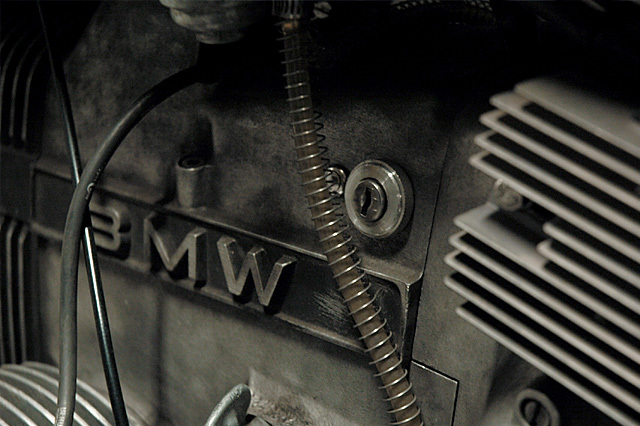 Meaning you can have both the vintage look with its classic post war ratty styling, mixed with relatively modern design improvements and BMW’s legendary reliability. 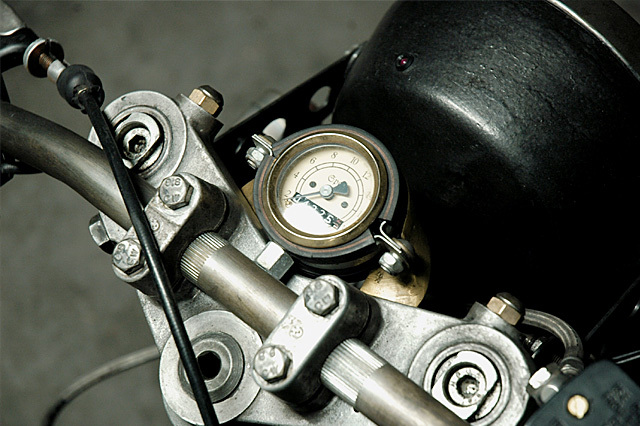 The other aspect is the ease with which a new builder like Arnaud can work on an airhead’s exposed and easily accessible top end, carbs, exhaust and then show these mechanical elements off for increased industrial chic. 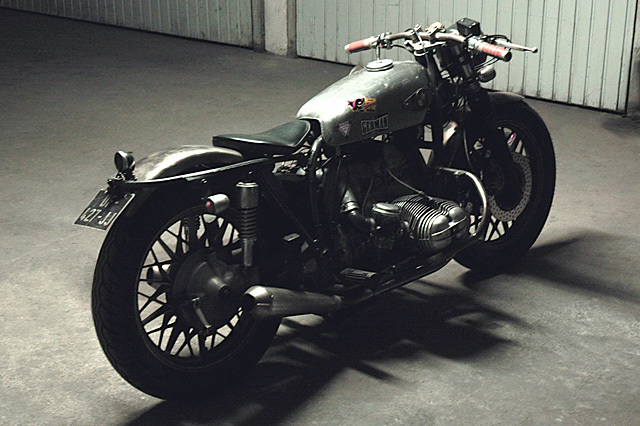 Which is exactly what he has done with the 650cc boxer block left in its raw metal casing look, with just the Scotch-Brite marks left showing only the most subtle hint of cleaning up. The functionality of the engine, often hidden, is also on full display with wiring, cables and even the regulator rectifier in full view. But to make sure the BMW is heard coming and to give a far tougher appearance the “nice” stock chrome mufflers have been swapped out for reverse cone shorties in a raw finish. Then there are the little touches that were important to Arnaud and make for great talking points when hanging with your riding friends. 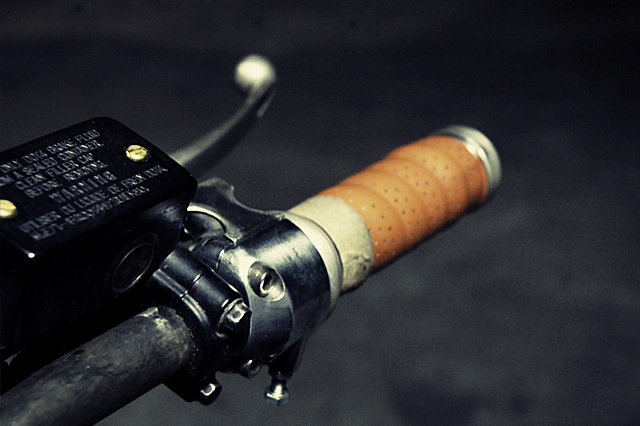 The seriously vintage speedo with brass bezel held to the bike with industrial clamps. The flat bars that were agonised over until the right set was found that have then been treated to hand wrapped leather grips. The riser bolts that look like they’ve been nicked from a building site and the relocated starter button that all cost nothing but one man’s imagination and a desire to create a bike for his tastes alone. 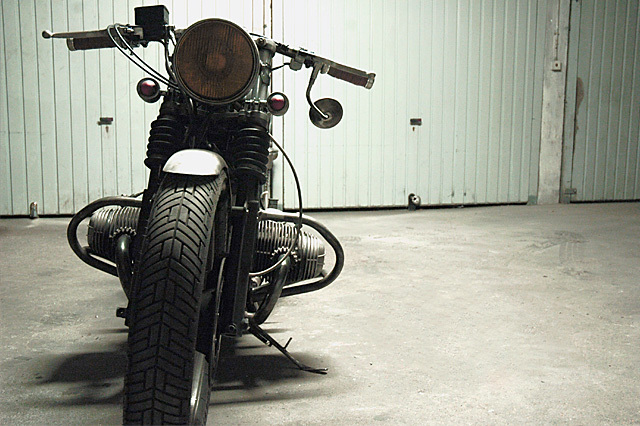 And that’s the point of these Rat bike builds, whether the rest of us like their aesthetics or not is of no concern, they’re about taking an old bike and making it work with whatever materials you have around. Arnaud learnt so much on this build that now along with his friend runs Shadow Motors Paris building and repairing bikes for their mates. There is a another BMW in the works but what you can count on is purely purposeful machines that are built on a weeks wages and yet still make you sit up and take notice. Leave it to the French to hand craft from old scrap a 70’s beater with so little money and yet end up with something so très cool.